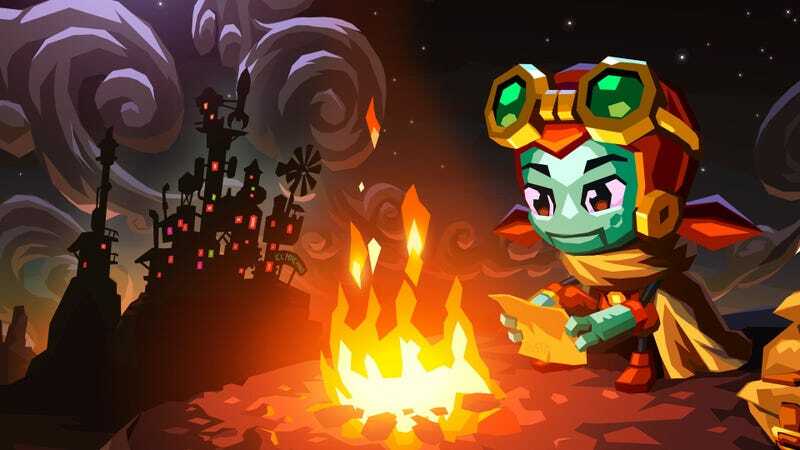 Image & Form bet the farm on SteamWorld Dig, an excellent platformer I devoured in almost a single-sitting. Thanks to its perfect drip-feed of items, areas and enemies, SteamWorld Dig‘s gameplay loop held my interest for the entire, short duration. Their follow-up, SteamWorld Heist, provided another addictive loop of shooting, stealing and spending, lasting just long enough to explore its brilliant mix of strategy and gunplay. SteamWorld Dig 2, Image & Form’s latest, shares everything in common with its older siblings except one, crucial element: It lasts too long. It didn’t hit me right away. My first couple play sessions ended with me reluctantly putting down the controller in amazement, saying, “this is such a great game.” But as the play clock ticked higher and higher, my enthusiasm dipped lower and lower. The loop of dig, fight, sell turned from satisfying to grating, culminating in an exhaustive four-hour sprint to the finish. So, how did it get to that point? How did such a charming, compelling, satisfying game that I literally amazed out loud about, multiple times, turn into feeling like a chore? Unlike Until Dawn, which took too long to get to the “good stuff,” is SteamWorld Dig 2 too much of a good thing? And how can that be? It may have to do with variety. SteamWorld Dig 2 only has about five areas I can think of. Were the game as short as the first Dig, this wouldn’t have been a problem. Heck, five areas may have felt like too many! A whirlwind of exotic locales at a pace too break-neck to process it all! But with Dig 2, you can spend hours in one area before its time to move on, only to come back later with new equipment and abilities…but fight the same enemies, encounter the same hazards and look at the same scenery. It all becomes too familiar. Compare this to the progenitors of the Metroidvania genre, Super Metroid and Symphony of the Night, two massive games where variety is the spice of life. It may be unfair to hold Image & Form, an independent studio, to the same standards as Nintendo and Konami’s best efforts, but that’s how we learn and grow, innit? Another part of the chore equation is the gameplay loop itself: dig, fight, sell. Dig to create a path deeper into the mine but also to find valuable gems and ore. The mine is as wide as it is deep, however, requiring backtracking in order to sweep up any missed ore. If, like me, you’re an obsessive and need to collect all the gems and ore? Well, that’s a lot of digging now, isn’t it? You can choose to avoid most enemies rather than fight buuuuut there’s an upgrade that makes them more likely to drop blood gems so if you want to maximize your profits, you better get fightin’. Sell to afford upgrades, upgrades that unlock powerful mods, some so good they, well, kind of break the game, don’t they? One mod, for example, makes it so your lamp never goes below 50% fuel level, effectively cutting out an entire aspect of the gameplay loop. You know how Blizzard tweaks Hearthstone cards so that certain ones aren’t no-brainers that end up in every meta deck? An infinity-lamp is a no-brainer. But doesn’t that kind of admit that lamp fuel was unnecessary in the first place? Zero Punctuation says near the same thing about fuel being perhaps one too many systems that continually force you to the surface. If you count the reasons to go to the surface, they add up really quick: sell goods, upgrade items and install mods but also to quickly top up your health, water or fuel. That’s not including mission objectives that involve talking to certain characters who live, yup, on the surface. Sure, it may be a short trip to the nearest transport tube but I can’t count how many times I’d be shaken out of my groove just to backtrack to the surface, only to head back down as soon the loading screen ended. Trips to the surface are so frequent that they become an inconvenient break in the action and turns El Machino into an unwelcome, repetitive sight. Compare this again to Super Metroid and SotN, where save points peppered throughout the map automatically heal your character while you save, rather than force arbitrary backtracking. You’re also able to equip your character in the start menu, instead of Samus’ ship or Alucard’s coffin. Then there’s the much talked about hook shot. I love the hook shot. I want a whole game centered around the hook shot (besides Flinthook.) What a wonderful mechanic–that’s completely swept away by the jet pack, a late upgrade that also practically breaks the game. Here’s my problem with the jet pack: the remainder of the game isn’t built around it. Dig 2‘s level design up to the jet pack is excellent, utilizing Dot’s entire move set in order to navigate main quests and optional caves. After the jet pack? All that wonderful level design just…goes away. The weird thing is, you can tell the levels were still designed as if you didn’t have the jet pack. This is backed up by the achievement, “Sequence Breaker, Destroy all devices without entering Vectron.” Cool, right? Optional hard mode! Only I wish I had the option before I knew there was an option. I’d have much rather finished the game relying on the awesome hook shot that’s built-in to the excellent level design than the jet pack, which renders most of the level design moot and added to my fatigue. And yes, I could have just not used the jet pack, right? But I’m not not going to use a thing when I get it. Compare this again to Super Metroid’s screw attack or Symphony of the Night’s transformations that are built into late-game sequences and don’t break the game. Boy, this comes across pretty harsh, doesn’t it? To reiterate, I loved SteamWorld Dig 2–up to a point. It wasn’t until the game play loop became a chore, the environments became too familiar and the platforming became too easy because of the jet pack that fatigue set in. Perhaps that’s why the consensus on Dig 2 is that it’s really great–but not perfect? Most of the reviews I’ve read haven’t really nailed down why that is. I guess I’m being harsh because I feel like we need to lay out whyit’s not perfect rather than just state it and leave it at that. Originally posted on my blog, The Gammelier, check it out!